I ran across this on ScottH's post today. The Mozy.com gives you 2GB of backup storage for free. 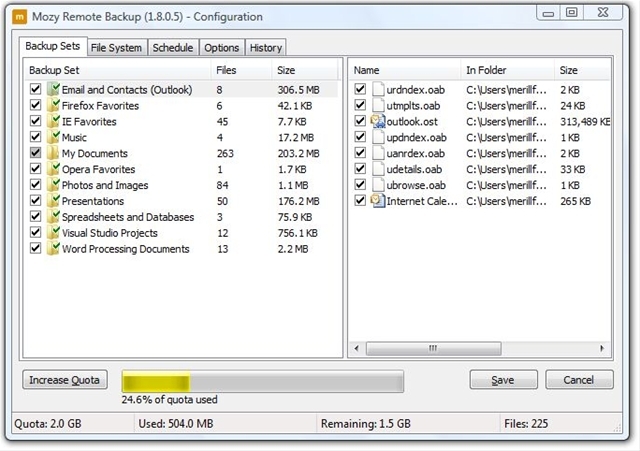 Currently, I use the free SyncBack utility to backup the stuff to an extra hard-drive on the local machine. I've thought of using GMail Drive as a remote backup option but then I would have had to muck around with all the syncing. Plus it's basically a hack with the 10MB and .zip/.exe blocking limitations of GMail. Mozy on the other hand makes it all a breeze! The initial setup identified all my stuff like IE/Firefox favorites, contacts and email, My Documents, Visual Studio projects, the list goes on. I can also set when it should sync and how much bandwidth it should take etc. Cool!